School ordered to end ‘racist’ hair rules. A South African school has been ordered to suspend allegedly racist hairstyle regulations after black pupils said they had been called monkeys by teachers for wearing banned “afros”, and were forced to chemically straighten their hair. Pretoria High School for Girls was given 21 days on Tuesday to re-assess its rules pertaining to black pupils’ hair after protests by students triggered a public dispute over racism. “Learners feel that they are not allowed to wear Black hairstyles, such as Afro. Specifically, the school policy limits the length of the hairstyle,” the education ministry said in a statement. The ministry said that the school’s “code of conduct ... must be reviewed and the clause dealing with hairstyles should be suspended in the meantime”. 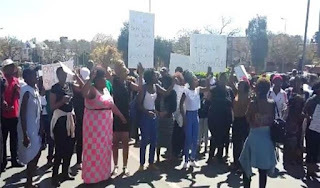 Suspension of the rules on hair styles was issued after talks on Monday between senior staff, pupils and Provincial Education Minister Panyaza Lesufi, who said an inquiry into allegations of racial discrimination would be launched.